Whether you are a Fedora, Ubuntu, Arch Linux or any other Linux distribution user you probably have used the lovable system monitor software, Conky. Being highly configurable, Conky is capable to display any system status such as CPU , disk usage, memory, temperature , emails and etc. on your desktop in various appearances. There are lots of customized scripts and configurations available for Conky thanks to the large community of Linux developers and here are 15+ useful and gorgeous Conky Configs you can use to give your desktop a fresh look! Click on the images to see a larger preview where possible. Check out Gotham in action on this Ubuntu Unity Desktop. Do you recommended any other Conky configurations or widgets? Share it with us in the comments! P.S : Some people call these configs as Conky Themes by mistake, this are not themes, they are just some tweaks which display useful information on the desktops. This entry was posted on May 26, 2011. It was filed under Linux and was tagged with Conky Clock, Conky Config, Conky Widgets, Fedora, Ubuntu. Thanks for the conky configurations! I’ll try to do something with my desktop, so boring right now. Hey, I would really like to use these, I am new (well) I would like someone to email me and tell me exactly how to make this work. I have a new installation of Ubuntu 11.4, It is up to date on an emachine about two years old, plenty ram, plenty everything, Thank you for your time. hey, install Conky through the ubuntu software center or the internet and after that everything is pretty simple. Just walk yourself through the set up after install. I remember, 3 years ago : only a rectangle side bar was possible. I never looks to it after, until now. Thanks for the listing ! Amazing how concky has evolved so fast throughout the years. Wow, So cool looking. Very nice looking desktops as well. 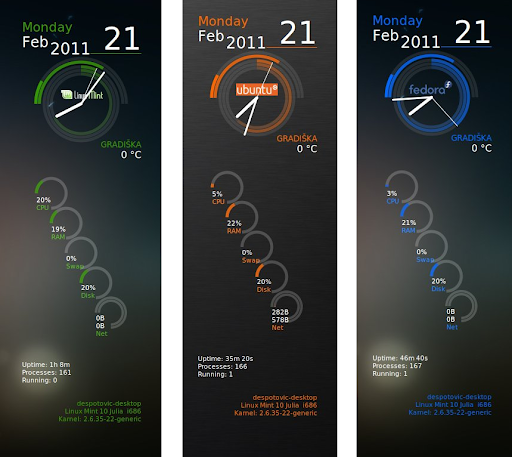 Conky – Planet & Just another conky . . . really the best!! !